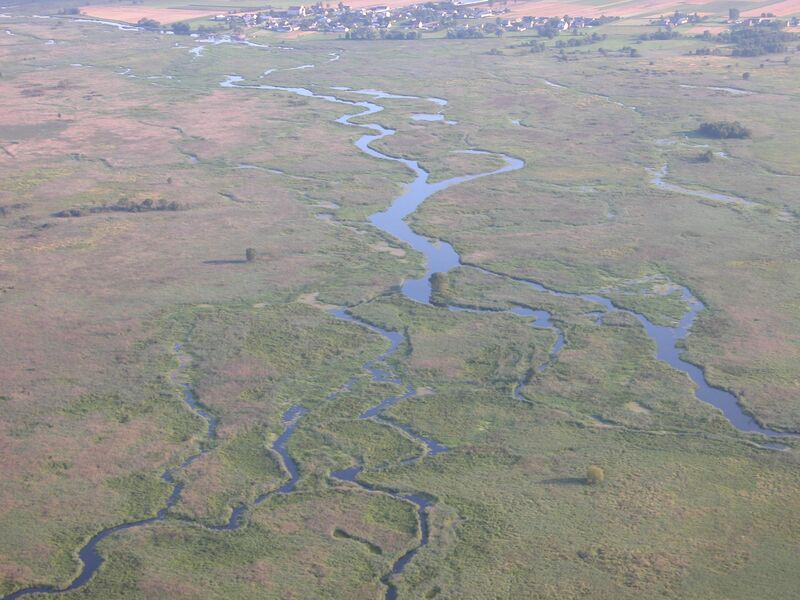 In the past the River Narew (Poland) split into multiple, interconnected, coexisting channel belts, thus creating numerous backwaters and oxbows. Such river systems situated on alluvial plains are referred to as ‘anastomosing’ in scientific literature. They distinguish themselves by a dense network of belts of variable width and length which by turns split and join. The hydrological regime of the River Narew manifested itself by long lasting flooding and additional intensive inundation by shallow groundwater. In the late 1970s, a reach of the River Narew between the village of Kolonia Rzędziany and the junction with the Biebrza River has been engineered. As a result, the network of multiple channel belts was replaced by one deep channel. The grasslands and meadows replaced the wetland ecosystems. Contrarily, the upstream part of the Narew River still consists of multi-channel riparian wetlands which in 1996 became a protected area called the Narew National Park (NNP; www.npn.pl). However, hydrological alterations in the regulated stretch led to the decrease of the groundwater level in the NNP favouring common reed expansion and shrubs encroachment causing a loss of ecosystem biodiversity. In the early 1990s, the Polish Bird Protection Association (PTOP) initiated a project focused on restoration of partly natural conditions in a so called buffer zone i.e. between the park and intensive grasslands. First restoration works began in 1996 on the oxbows near the village of Rogowo. In the period 1996-2001 the oxbow lakes were cleared and the shrubs, mud deposits, reeds and their parts were removed. The next step was the construction of new river channels through the Rzędziany-Pańki dike (which is the border between park and grasslands) aiming to restore the multi-channel system. The first of two stone rapids in the main artificial channel was constructed in 2007 and the second was finished in 2010. The aim is to increase the water level in the downstream part of the park. Farmers in the surrounding area have strongly protested against the construction of rapids. 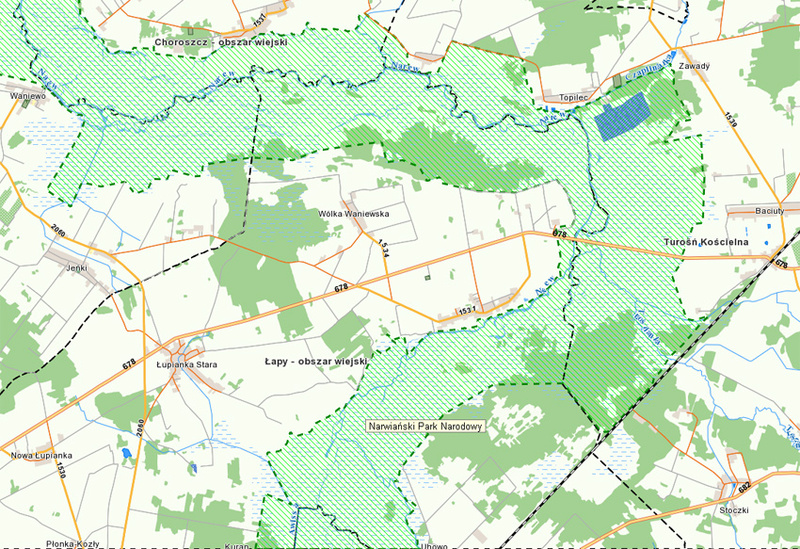 The area exposed to restoration works is situated in the northern part of the NATURA 2000 PLB200001 site called Bagienna Dolina Narwi (the Wetland Narew Valley) stretching between the villages of Kolonia Radule and Żółtki and covering ca. 13.4 km2. This area is located on the downstream border of the Narew National Park. The Narew National Park was founded in 1 July 1996. It is situated in the north east of Poland, in Podlasie Province, 30 km west from its capital, the city of Białystok. Its headquarters is located in the village of Kurowo. The Park covers 6,810 ha of the Narew 45 km long valley bottom between the villages of Suraż and Rzędziany. Within the NNP 98% of soils are permanently or temporarily inundated. The objective of the Park is to protect the wetland valley covered by alder carr, sedge and sedge-moss meadows. The Narew River is one of the case studies of REFORM aiming to assess the interaction between restored stretches and the status of the wider catchment.